The University of Maryland Archives works to ensure the continued preservation of and access to the many aspects of university history. Our collections include documentation from the President’s Office, various academic departments, student organizations, fraternities and sororities, protests and politics on campus, and athletics. Documentation comes in all formats as well: paper documents, publications, photographs, film reels, videotape, memorabilia and even digitally produced items like electronic documents and video recorded on cell phones! Preservation is often the most urgent need for items within our collections – especially film and video, which are particularly vulnerable to damage as they age. Video can breakdown and become unreadable by any machine within about thirty years of creation. Think about how many VHS tapes you wouldn’t be able to watch now, even if you could find a working VHS player! Film is a bit more stable, but tends to lose sound after about forty years of deterioration. Without any reservation measures, the deterioration can create a silent film! Digitization can extend the life of film and video. Conversion to a digital format allows archives to limit access to the original item, while ensuring that researchers and other interested parties can still benefit from the content. In the past, the University Archives has digitized multiple collections within our holdings including football film, yearbooks, and much of The Diamondback student newspaper. These resources were selected for digitization because researchers, students, and out own staff working on special projects frequently requested access to them. Sports footage is also of particular interest for external media outlets like ESPN, the Big Ten Network, and documentary filmmakers. Recently we have begun a project to preserve all the men’s basketball footage in our collections, which will result in the digitization of nearly 5,000 hours of game action from 1953 to 2014! Once digitized, all of this footage will be available through the Archives’ digital collections website, University AlbUM. To complete this critical project, once we’ve raised enough funds, we send the film and video out to a vendor to be converted. Content descriptions will be uploaded to our digital collections site alongside the new digital file for free, public access. The new digital file will also undergo continued digital preservation to ensure its ongoing stability. 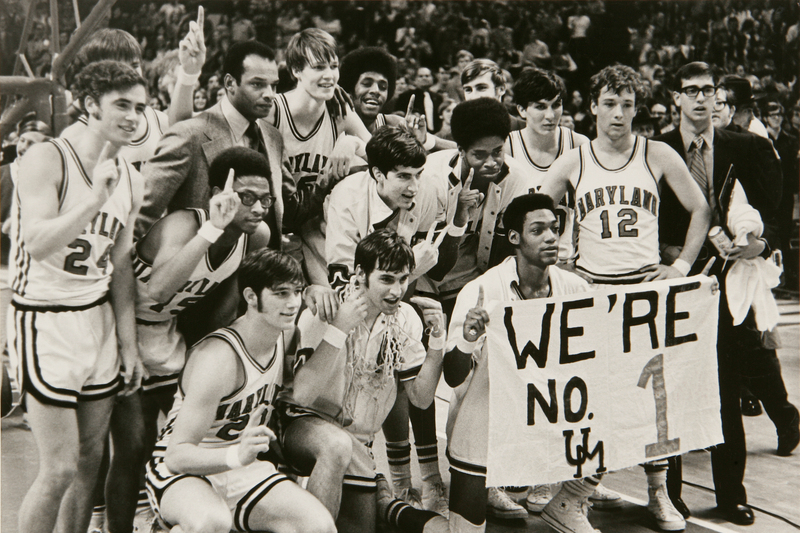 If you’re interested in making a gift or learning more about our mission to Help Preserve Maryland Basketball History, please visit our LaunchUMD campaign! Additional questions about the University Archives can be sent to Kendall Aughenbaugh at kaughenb@umd.edu.